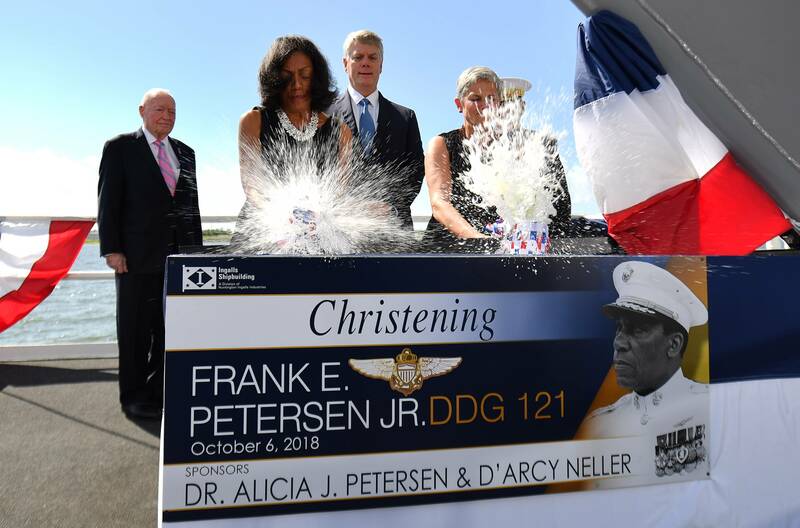 U.S. shipbuilder Huntington Ingalls Industries’ (HII) Ingalls Shipbuilding division christened the guided missile destroyer Frank E. Petersen Jr. (DDG 121), the 71st in the U.S. Navy’s Arleigh Burke (DDG 51) class of destroyers and the 33rd built by Ingalls. DDG 121 is co-sponsored by Alicia Petersen, widow of the ship’s namesake, and D’Arcy Neller, wife of Gen. Neller. Together, Petersen and Neller officially christened the ship by breaking two bottles of sparkling wine across its bow. Arleigh Burke-class destroyers are capable, multi-mission ships and can conduct a variety of operations, from peacetime presence and crisis management to sea control and power projection, the builder said. The guided missile destroyers are capable of simultaneously fighting air, surface and subsurface battles. The ship contains myriad offensive and defensive weapons designed to support maritime defense needs well into the 21st century.